But I read Rushdie’s memoir Joseph Anton not too long ago and was taken with the idea that I should really read The Moor’s Last Sigh which was written his exile due to the Fatwa (Joseph Anton was the name Rushdie used while in exile). So because this was a Booker short-lister I nominated it over at the Booker Prize Reading Group and here I am. Sad to say it took me a bit to get into this possibly because I’ve been reading so many top-notch books lately, but finally, about 50 pages in, it felt like Rushdie at his finest and for the most part very, very satisfying. And then I got lost again. What is this book about??? And then I was disappointed. 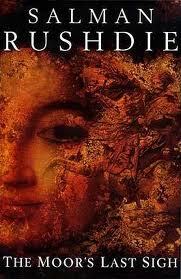 The setting of the tale is mostly Bombay but the family moved there from Goa when the protagonist was 5 years old. Goa remained a Portuguese territory until 1961 when it was taken militarily by India – India had only been independent for 13 years at the time. This is perfect for Rushdie’s celebration of the mongrel which he elaborated on in The Satanic Verses which put him in exile. But this time his “celebration” does not have a happy ending. Mine is the story of a highborn cross-breed. [p. 5]. Christians, Portuguese and Jews; Chinese tiles promoting godless views; pushy ladies, skirts-not-saris, Spanish shenanigans, Moorish crowns, can this really be India? [p. 87]. The story is told in the first person by Moraes (or Moor or Mo) Zogoiby who on the opening pages is in exile in a graveyard somewhere in Spain. He is the last of four children, and the only male, from the union of the beautiful Catholic heiress and painter Aurora de Gama and the Jewish Abraham Zogoiby, her husband, an ex-warehouse supervisor. The history of their families takes up the first third or so of the book and is worth the time. There’s a short but very helpful family tree for the families in the front pages – the family says their genealogy goes back to Vasco de Gama. It’s a tale of ethnic and religious differences, heritage, and wealth. Moraes is born in 1957 in full development after only 4 1/2 months in the womb. He also has a deformed right hand at his birth. His size and rapid aging are because Aurura mentioned in front of a witch that she needed a child who would grow up fast. So he’s in a time-travel warp or something and he’s very large and aging rapidly – he ages at twice the speed of normal humans. On the down-side, the frequently non-linear sequencing (lots of backstory) can be quite confusing, but there is a loose linear sequencing in general terms. And the book is basically episodic, a picaresque and this complicates any kind of over-arching plot or theme. But the real problem, I think, is there is a whole lot of satire and “statement” which is just flying way over my radar. For instance, what does the Moor’s whole existence as a “speeded-up” person mean? And prior to Moses’ birth a certain Vasco Miranda was hired as a painter for the family but he left people out and painted over the originals. I suspect this means something in a metaphorical way but how am I supposed to know what? Later, Aurora’s paintings do similar things and more surrealistic things with the people in the family but again, why? So I’m lost although I did read it. I think I know that it’s about ethnic and cultural mongrelism, losing your identity and then finding it in the mass of others who have also lost theirs. It’s not a happy book. I think I may have to read what some of the better reviewers have to say. Norman Rush’s review in the NY Times is more positive but he also has some less than glowing things to say. Finally, on a more academic note, John Clement Ball, University of New Brunswick, analyzes the satire which is at the heart of The Moor’s Last Sigh. In this way it’s a kind of sequel to Midnight’s Children and the peaceful cosmopolitan hopes of nation as evidenced by one family in Bombay. I have yet to get through a Rushdie book – my fault I’m sure, rather than anything to do with him. However, ‘The Ground Beneath Her Feet’ is coming up in one of my book groups before Christmas so i am going to have to change that. Is it one of your favourites? I’ve read most of Rushdie’s long works and sad to say, imo, he’s very uneven going from the brilliance of The Satanic Verses and Midnight’s Children to the sad bottom of Fury. He tends to use the same major theme with lots of ways of presenting it – the theme is the mongrelism – mixed ethnicities – of the world today especially India but elsewhere as well. He has a brilliant almost circus-like style with an abundance of highly imaginative, very active and colorful imagery as well as unusual metaphors. The plots are usually convoluted and perhaps episodic more than unified. HIs style and plots work quite well with the techniques of post-modern lit. This is true of Fury also, but imo, it doesn’t work as well there. This sounds weird maybe but it seems that Rushdie writes a lot better when he’s happy than when he’s not and there has been a significant amount of unhappiness in his life. No – The Ground Beneath Her Feet is not one of my favorites but it’s not the worst either.